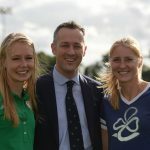 In attendance were Rio 2016 Olympic heroes Claire Lambe (UCD and Ad Astra Graduate, Old Collegians member), Sinead Lynch, Gary O’Donovan, Paul O’Donovan (UCD and Ad Astra Student) and Sanita Puspure (Old Collegians member) along with distinguished guests including UCD President Professor Andrew J Deeks, Rowing Ireland President Con Cronin, former Olympians Sean Drea, Martin Feeley, Neville Maxwell, Niall O’Toole, Jaye Renehan, Willie Ryan and representatives from Ad Astra Academy, Old Collegians Boat Club, UCD Boat Club and UCD Sport, among others. 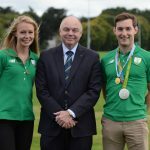 The event was compered by Gerry Murphy of Neptune Rowing Club with Professor Deeks, Rowing Ireland President Con Cronin and Old Collegians President Murrough O’Brien all speaking of their pride and admiration for the athletes. 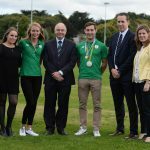 Murrough reserved a particular mention for Sanita Puspure who he said had forged the way for others as Ireland’s only rowing representative at the London 2012 Olympic Games. 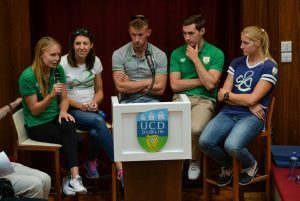 The athletes fielded questions from the audience, including the topic of time management, as each athlete had combined a mix of study, work or raising families with their training. 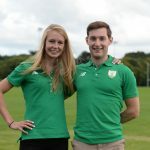 Claire and Paul both highlighted the support given to them by UCD and the Ad Astra Academy during their studies (Mechanical Engineering and Physiotherapy respectively) which allowed them to train at the highest level while also completing their academic duties, while Claire also mentioned the part-time research she conducts for wave energy developers Jospa Ltd as an important component in maintaining a career path beyond rowing. 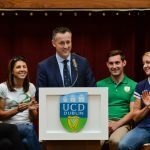 Gary said that college life and rowing balanced well for him and he was able to enjoy both, with each providing a welcome rest from the other. Sanita emphasised the important of planning and time management as she raised a young family while training full-time, as well as the support of her husband Kaspars. 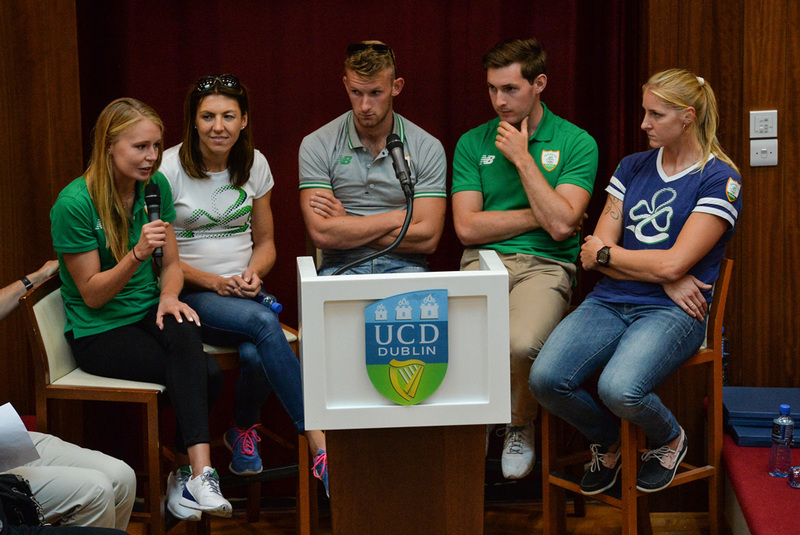 Sinead also has a young family and mentioned that rowing provides an enjoyable counterpoint. Sean Drea (three-time Diamond Sculls winner at Henley Royal Regatta 1973-75, Single Sculls World Silver Medallist 1975 and Single Sculls Olympian 1976) spoke to congratulate and thank the O’Donovans for winning an Olympic medal and “getting the monkey off [his] back”, a sentiment echoed previously by Neville Maxwell. 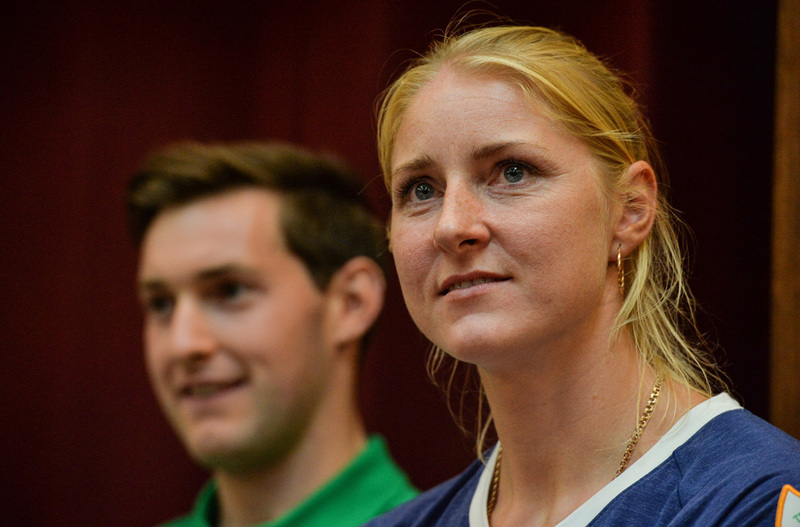 Both athletes finished 4th in their Olympic finals, the highest finish by an Irish crew before 2016. 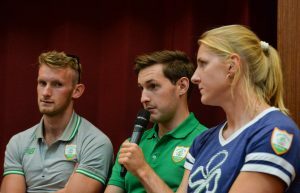 Questioned about their “secret”, Paul joked that their coach Dominic Casey enjoyed keeping a low profile while people made guesses about a secret training programme, but in reality there is no secret – just a lot of long, hard work, dedication and determination from the athletes themselves, their coaches and their support network. The Donovans passed their Rio Olympic LM2x silver medals around the room with Paul’s 2016 World Championship LM1x gold medal also shared. The event concluded with a question regarding just how much work was needed to reach these athletes level. Gary had a short answer – “8,000km since we qualified”. 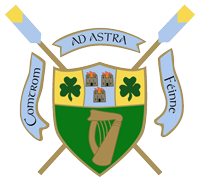 That could be divided many ways over the course of that year but the answer will remain – long, hard work, dedication and determination. Many thanks to the individuals and groups that facilitated this event.